In this time of global transformations our design practices are shifting. While we are transferring skills to automated intelligent agents, we are defining our voice in the socio-political discourse that responds to human actions of the past and present. To successfully navigate these new interconnected systems and position ourselves as critical practitioners, we have to explore new ways of understanding design as a mode of inquiry. In that sense, the reflection of our methodologies, our abilities to research, and an open discussion of how we generate, document, and circulate new knowledge are crucial at this very moment. We ask participants to shift who they are responsible to: Don’t think about your portfolio. Don’t imagine a client or try to please your professor. What could you do for your city? Your community? Your neighbor or maybe a global culture? The Phaistos Project — Forty-five Symbols is calling for research-driven and self-directed observations, experiments and speculations that provide new perspectives on the way we live. 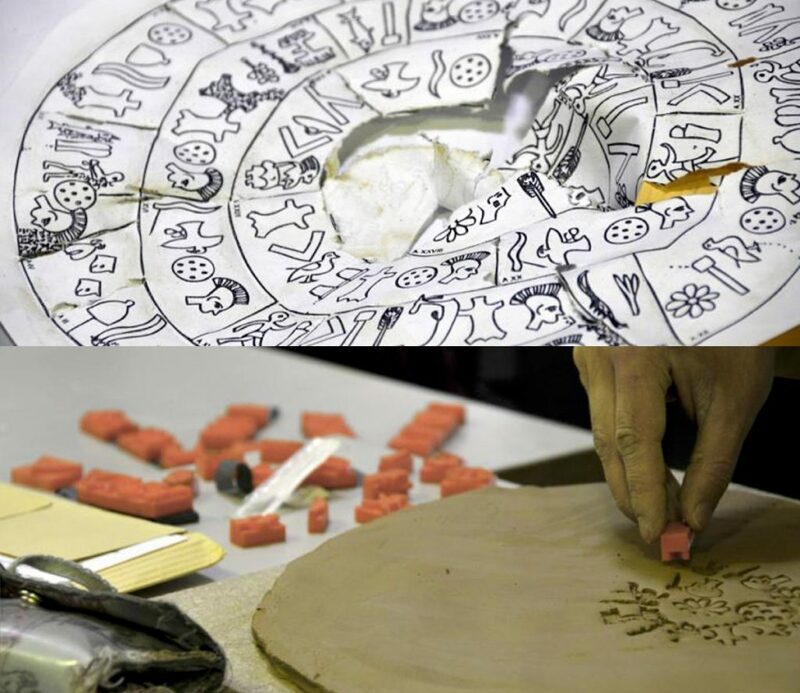 Early 2018, linguist and archaeologist Gareth Owens announced that he and his research group have deciphered “more than 50% of the Phaistos Disc”. The article on the website Archaeologist & Art continues: “in collaboration with Oxford phonetics professor John Coleman, he has progressed in the “reading” of 99% of the disk.” (Athens and Macedonian News Agency, 2018). They believe this textual representation is a religious text, a prayer to a goddess. Still, there are many unresolved questions about the disc and it remains a mysterious artifact of archaeology and writing systems. What we know for sure is that the clay-impressed notation has 241 tokens, comprising 45 distinct signs. The Golden Records are phonograph records made of vinyl. They store analog signals of coded images and sounds to portray the diversity of life on Earth. They are intended for any intelligent extraterrestrial life form, or for future humans, who may find them. They have been included aboard the Voyager spacecraft launched in 1977. Their physical distance is increasing by the second, yet they share — on purpose or randomly — information about how we, as humans, observe and document our everyday. While the writing system of the Phaistos Disc utilizes icons of mundane everyday-life-objects, the Golden Records characterize humanity, for example, with images showing the “acts of licking, drinking, and eating”. As scientists, we could apply forensic analysis and use carbon dating techniques to break the silence of the Phaistos Disc. Equally, we could use modern specialized instruments and software to track the Golden Records. However, we are also allowed to simply look at them through the lens of our personal history and cultural context. In that sense, The Phaistos Project is applying Experimental Archeology as a mode of inquiry. We question material, form, content, meaning, use, benefit — nothing is off limits. Which ways of thinking could a clay disc open for young designers who grew up in the digital age and perceive the world through screens (which are squares)? One interesting fact is that the number of tokens on the disc — 241 — is very close to how we communicate today: tweets and short messages have almost the same number of characters. Spiral of Symbols. Kunststation Sankt Peter, Cologne, 2014. 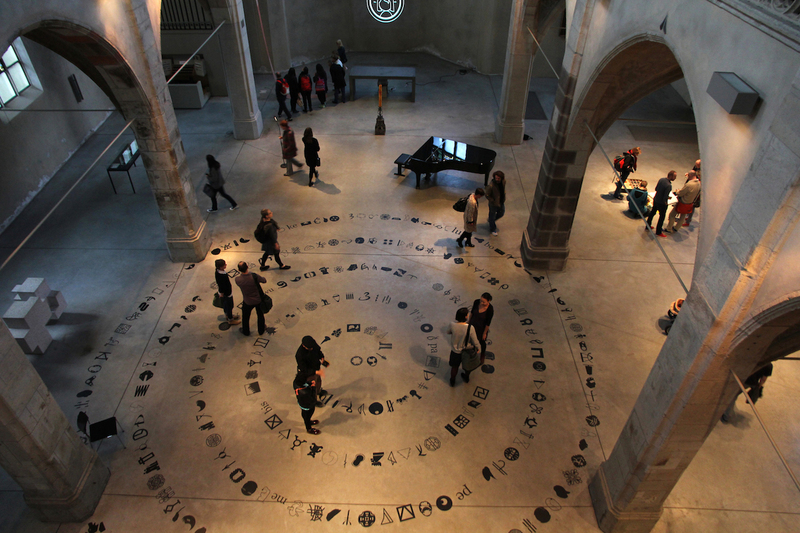 The outcome of this collaboration was exhibited 2014 in Cologne at Kunst-Station Sankt Peter — a unique space that combines faith and liturgy with contemporary music and visual art. The gigantic spiral of symbols visually united the concerns and questions of design students of diverse cultural backgrounds. Since 2015, the initiative invites for project submissions once a year. An international Jury selects winning projects that are published in a series of magazines. So far, we received 212 submissions from students coming from more than 43 different countries. This website only shows a curated selection. The participants observe, experiment, and speculate to capture a meaningful fraction of their everyday. The future might read their visual narratives as a writing system. It might not be understood as a tool of communication but as a commentary of this very moment and its local and global challenges. Colomina, B., & Wigley, M. (2016). Are we human? : Notes on an archaeology of design. Zurich: Lars Müller. Athens and Macedonian News Agency. (2018). Gareth Owens: “More than 50% of the Phaistos Disk has been deciphered.” February 02, 2018. Accessed March 27, 2018. https://www.archaeology.wiki/blog/2018/02/07/gareth-owens-50-phaistos-disk-deciphered//. “NASA. (2013). NASA Spacecraft Embarks on Historic Journey Into Interstellar Space“. NASA. September 12, 2013. Retrieved April 15, 2014.